DOES ANYBODY RECOGNISE THEMSELVES, OR DO YOU KNOW THEM? 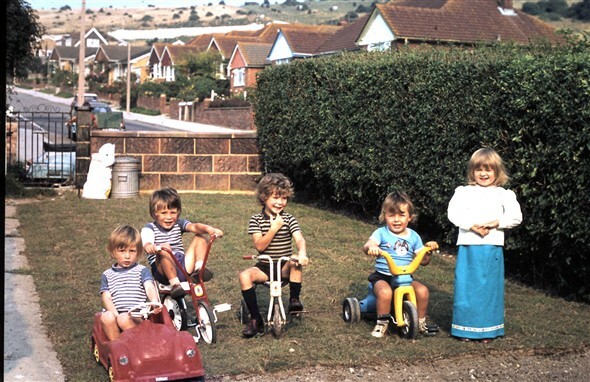 I have had a request from my brother Stuart Baitup (the one on the red trike) asking if I could post these pictures on the site in the hope that someone somewhere will know the others in the photos. Stuart lived in Denton (The Grove) but now lives in the Deal area of Kent. These pictures were taken in the back garden of a house in Lewis Close, Denton, if that's any help. This page was added by P Baitup on 06/08/2010. Is the man in the top picture Terry Richardson? I believe he moved to Denton when he got married in the early 70s. I think he had a son and daughter; so, if it is him, one boy and one girl are probably his. The bottom of the two pictures was almost certainly taken in the garden of the bungalow cnr Thompson Rd and Cantercrow Hill/Denton Road--it was my Grandmothers house at one point but I know not the people. Looks to be late 60/s early 70's ? I think your memory is playing tricks on you Dave. This picture was definitely taken in the back garden of the end cottage in Lewis Close looking east up Cantercrow Hill. The white line marking the end of Thompson Road can be seen through the back gate and is opposite the two street signs marking the end of Denton Road and start of Cantercrow Hill. Today a large garage/shed stands on the land the children are playing on. It does look like Terry Richardson. On a different note, some of the bungalows on Cantercrow Hill were built by Bannisters Builders, which I worked on as an apprentice carpenter. I remember the carpenter I was working with (Fred Canning) who, (much to Mr Bannisters surprise), announced his retirement when we finished one of the roofs. Fred taught me that it was possible to pitch roofs on your own using jigs he had made. Those jigs made work so much easier. Fred gave them to me and I used them for years. He was a lovely chap to work with and used to call me "old young-un". 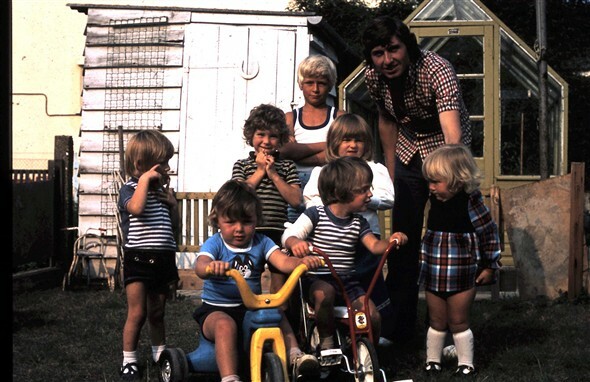 This is my Dad Terry Richardson, and the little boy on the yellow trike is my brother Paul. I'm nowhere to be seen - I would have been only a baby at this time! !